Ignore the headlines, the next crisis is here. A trade deal, even if one appears, won’t stop what’s coming. One of our proprietary “crisis” triggers just hit. This trigger has only signaled TWO other times in the last 30 years. Every single time it was just before a crisis hit. I’m talking about the ratio between the S&P 500 and the $USD. 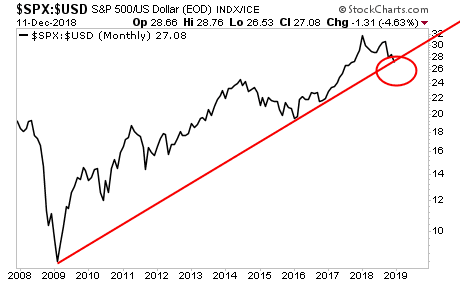 Here’s how it works… we all know that the Fed’s primary strategy to maintain the system is to devalue the $USD in order to inflate asset prices. As a result of this, during bubbles, stocks dramatically outperform the $USD as they soar higher courtesy of Fed easy money. 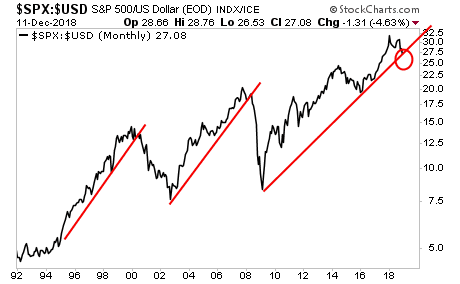 When this trend ends, and the $USD begins to outperform stocks, the cycle is OVER. As you can see in the chart below, this has caught EVERY SINGLE crisis since the early ‘90s. April 2001, within three weeks of the EXACT top for stocks. December 2007, within three weeks of the EXACT top for stocks. And it’s just hit today… as the below chart shows. We just published a 21-page investment report titled Stock Market Crash Survival Guide.